Sacred Shika deer on the road to Kasuga Taisha (春日大社, Kasuga Grand Shrine) in Nara Park, Nara. 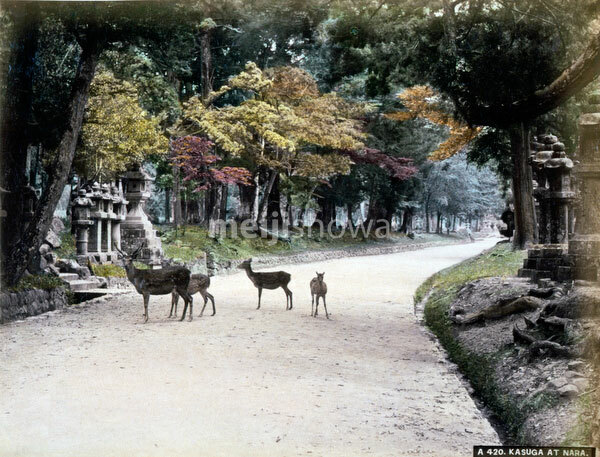 The park was established in 1880 (Meiji 13). Until 1637, killing a sacred deer was a capital offense punishable by death. After the end of WWII, the divine status of the deer was officially removed, but they are still seen as sacred locally and they’re legally protected from hunting.